I just found this super adorable company called Zubugs Organics. These are made by the Zubels company. These are little rattles that are shaped like different bugs. The one I got is a cricket and it’s so cute! The rattles are all 100% organic, they use 100% organic yarn to make them. They are 100% hand made as well, which I love! It’s so hard to find hand-made items these days especially crochet. It reminds me of something my grandma would make my kiddos when she was still able to. So it really warms my heart for my kiddo to play with it. It’s a soft rattle so it’s not to loud. They have a ton of detail on them and are really nice little items that could even be handed down as a family keepsake. They have an entire collection of different designs so make sure to check them all out and collect them all! Grasshopper Gordan has a spring in his step! This hand knit grasshopper baby rattle is hand knit using 100% organic cotton yarns and is perfect for babies and toddlers. 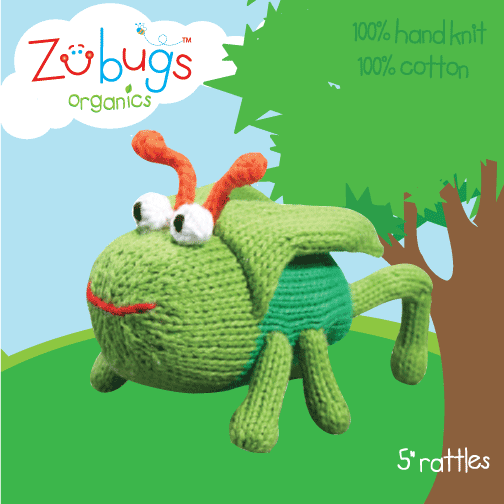 This rattle is 4 x 3 inches and is part of our Zubels Organic Zubugs Insects collection featuring bug and insect toys made from 100% organic cottons and 100% eco-friendly dyes. You can purchase them on the Zubels Website! Right now they are 50% off!